Korean pears are like the celebrities of the fruit world, and they live a posh life befitting their status. During the growing process, the trees are carefully trimmed so that only a few pears grow on each branch, which allows each pear to grow bigger and fuller (think Bel-Air estate). On the tree, each pear is fitted with its own protective jacket around its skin (think security detail). And when they’re ready to ship, each fruit is wrapped in its own foam netting (think private jet). Just about the only thing these pears don’t have is a rider on their contract calling for all-white lillies and M & Ms in their dressing rooms. But when it’s time to take the stage, these pears nail their performances every time. 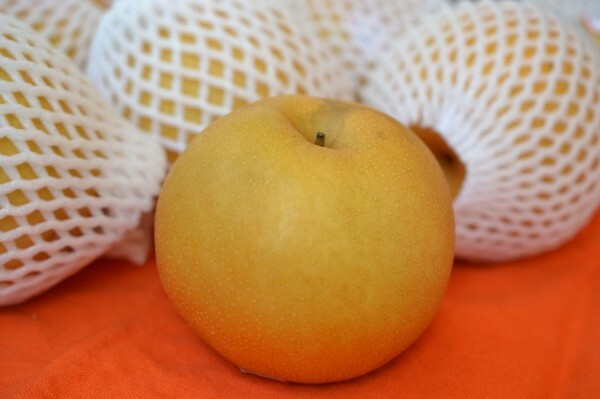 Smooth and blemish-free with a delicate thin skin, they have a consistently clean, fresh, juicy taste. We’ve been thinking about posh Korean culture a lot lately because our kids are crazy about the Korean pop mega-hit from PSY called Gangnam Style. (Gangnam is a wealthy district in Seoul; ‘Gangnam Style’ refers to a trendy, hip, and luxurious lifestyle.) After the 1,000th time watching the video, we thought, “We oughta give these Korean pears the Gangnam style treatment.” We sliced them, paired them with some wildly colorful cabbages, and garnished it all with a special Korean-style dressing that is befitting of…well…a true celebrity. Core the Korean pears and cut them into thin, matchstick-sized pieces. Slice both cabbages into long thin slices, about 2 or 3 inches long. Chop up three of the green onions (white and green portions). Place the pear, cabbage, and onions in a bowl and set aside. In a small bowl, whisk together the oils, vinegar, tahini, pepper flakes, lime juice, brown sugar, and garlic. Adjust seasonings to taste. Pour the dressing over the cabbage mixture and stir gently to combine. Chop the remaining green onion and garnish the salad with it. Serves 6. Hungry for more Korean pear coleslaw? 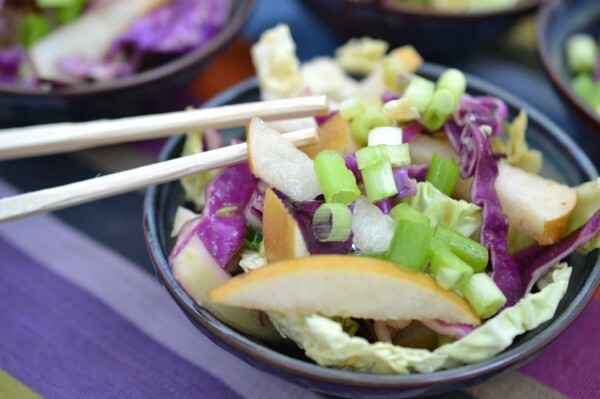 Check out this Asian-Style Slaw with Korean Pears from our friend Valentina at Cooking on the Weekends. 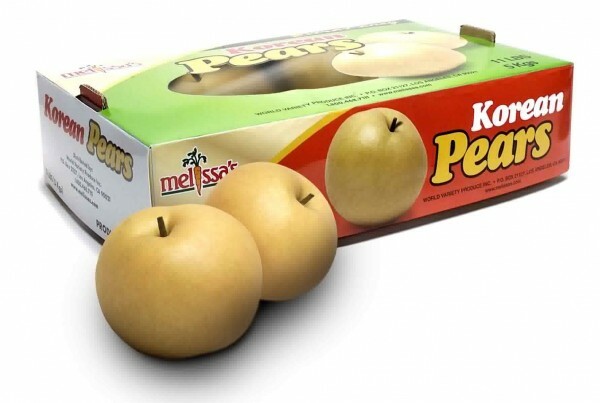 Want to buy Korean pears for yourself? The season has begun, and they should be appearing in stores by next week. Look for the Melissa’s logo and the posh little white jackets. Blogger disclosure: Melissa’s provided us with Korean pears to sample; we did not receive compensation for this post. The opinions expressed are our own. That cole slaw looks fantastic! Great idea! Thanks, Dorothy! It was fun to make! Your photo of your recipe is absolutely gorgeous and I know the recipe is delicious. You’ve proven again that if you start with the best, freshest ingredients, go with your instincts, and keep things simple, you can’t go wrong. Love the posh/Gangnam style references too. Love the intro! So cute! I love how good this fall salad sounds – Korean pears are a favorite – love how sweet and crunchy they are!